Isotretinoin, the medicinal component in Clarus, is part of a class of drugs called retinoids, which are substances related to vitamin A. Isotretinoin is the most potent inhibitor of sebum (natural oil) production and is used in Clarus to treat the most severe types of acne. Why do doctors prescribe Clarus 40mg? Doctors prescribe this medication for patients who have not responded to other acne treatments like benzoyl peroxide or antibiotics. Clarus helps to treat severe forms of acne like nodular and/or inflammatory acne, acne conglobata and recalcitrant acne. Isotretinoin works in several ways to treat severe acne. This medication reduces the size of the skin’s oil glands and greatly reduces the amount sebum (oil) production. Since the oil is decreased, the bacteria which live in the sebum is reduced. Isotretinoin also has anti-inflammatory properties. Finally, the production of skin cells inside the pores is reduced which helps prevent pores from becoming clogged. 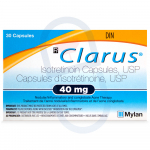 Clarus 40mg is available in blister packages of 30 capsules. Because of the risks of birth defects, your doctor may limit your Clarus prescription to 30 days so that continued treatment will require a new prescription if you are of child-bearing age. Take these capsules orally with food. Based on your particular diagnosis, your doctor will prescribe the right dosage for you. These may not be all the side effects of Clarus 40mg. Clarus is contraindicated in patients who are pregnant, breastfeeding, taking tetracyclines or taking vitamin A supplements. Do not use Clarus if you have an allergy to retinoids, high blood fat, liver disease, or kidney disease. Discuss the risks and benefits of treatment with Clarus as it may cause serious side effects. Your doctor will ask you to read and sign a form indicating you understand some of the serious risks of this medication. Store Clarus in its original packaging away from heat and light. Keep out of reach from children. Clarus does not need to be refrigerated. Store it at room temperature. A pimple is a small pustule caused by a combination of oil, clogged pores and bacteria. Acne is a broader term ranging from very mild to severe acne. When acne becomes severe, symptoms include large, pus-filled lesions (cystic acne) or hard inflamed bumps (nodular acne). Acne can occur on the face chest or back and can lead to scarring. Acne is most common among teenagers with a prevalence of over 70 percent. Hormones, especially androgens, can trigger the sebaceous glands to produce more sebum in both men and women. While not life-threatening, acne can be upsetting and cause psychosocial problems. The good news is that there are many effective treatments available which can prevent potential permanent scarring and raise self esteem. Where can I buy Clarus 40mg? You can order Clarus 40mg from YouDrugstore. We are an online pharmacy based out of Canada. That means when you buy Clarus 40mg from us you pay the same price that most Canadians pay. All you have to do is register on our website and fill in all of the required information. Then send us your prescription so that our licensed pharmacy technicians and physicians can review your order once we have received all of the necessary information. 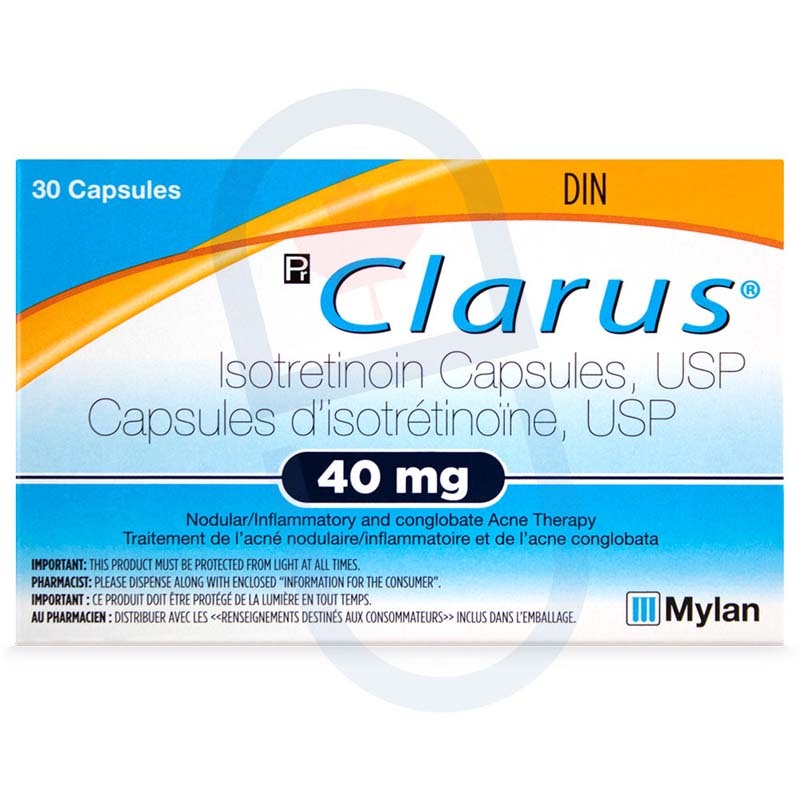 When you purchase Clarus 40mg from YouDrugstore enjoy our low cost in shipping. We even offer free shipping on any order over $100. Clarus is used to treat severe acne. Order Clarus 40mg from YouDrugstore today and start treating your skin condition as soon as possible.